As a preteen living in a world before everyone had the internet and there was such a thing as iTunes finding out what music was and then finding the music could prove difficult. For a number of years I had been captivated by the opening music of Impressions de France, but even my mother and grandmother’s French heritage didn’t seem to help. Finally, after so many years of needing to know what this piece of music was so badly that I was about to burst at the seams, this shy middle school boy wandered up to a Cast Member at the entrance to the film and asked if he knew the music that opened the movie and I tried to hum a few bars (this could not have been a pleasant exchange for either of us). He smiled, asked me to wait for a moment, and reached around the door before producing this piece of paper. Everything I could ever want to know about Impressions de France’s score was now mine. He pointed out the singular piece of music that I had been pining after for years: Aquarium, composed by Camille Saint-Saens. He continued to smile as I thank him and sprinted away in unabashed ecstasy. Unfortunately, I soon realized, my mission was far from over. At that time, finding a particular CD of classical music was just as difficult as finding out what the music was you were looking for in the first place. 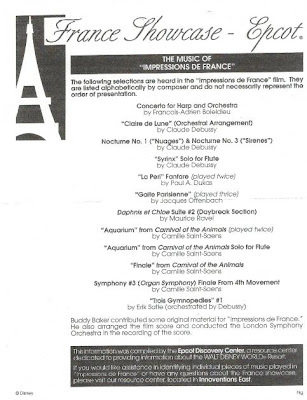 I searched every music store in the county, but could not find a single recording of Camille Saint-Saens Aquarium performed by the London Symphony Orchestra. In the end, I opted for single compact disc I was able to find with a recording by the Philadelphia Symphony. Not only did I find the piece I had been looking for, but I feel in love with the entire collection of Saint-Saens, and other impressionistic composers, work. I must have played that CD a thousand times, conducting my own bedroom orchestra, because I not only heard the music, I felt the music deep down inside. That old CD still sits in a place of prominence in my collection. I don’t listen to it very often because I’ve uploaded it to my iTunes and iPod and listen to it through these programs and players regularly. Nowadays there are sites like Disney Music Loops and cell phones with music recognition programs to speed up your search. Rather than traversing every road you know to obtain the music we seek we have Amazon and iTunes at our fingertips. I love having the technology that brings more to its users than ever before, but part of me wonders if the music that has become so much a part of me isn’t that way because of the journey we took to find one another. Great article (and a nice piece of EPCOT memorabilia). My appreciation for classical music really began with a two-disc version of the Fantasia soundtrack. I think individual discoveries such as these are a big part of what the creators of EPCOT (and Fantasia) were trying to accomplish.